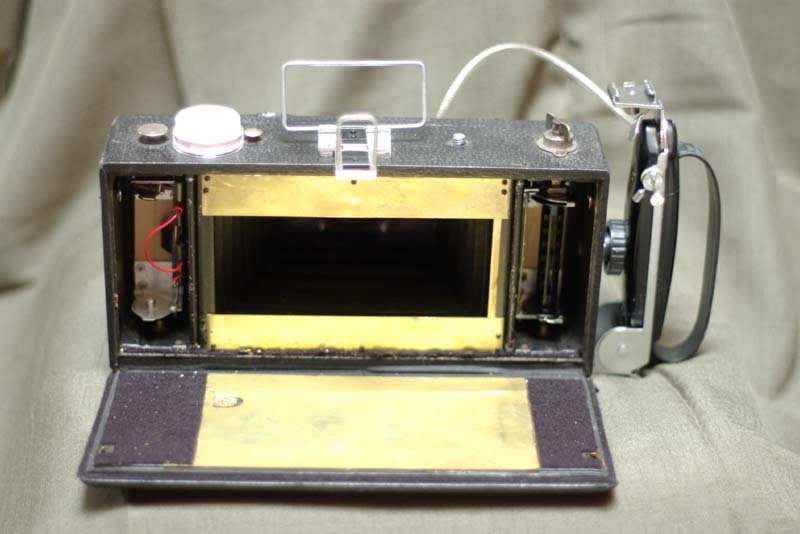 I got the idea for this panoramic camera from this article on Robert Monaghan’s medium format site. It started life as a rather battered Kodak 3A horizontal folder. 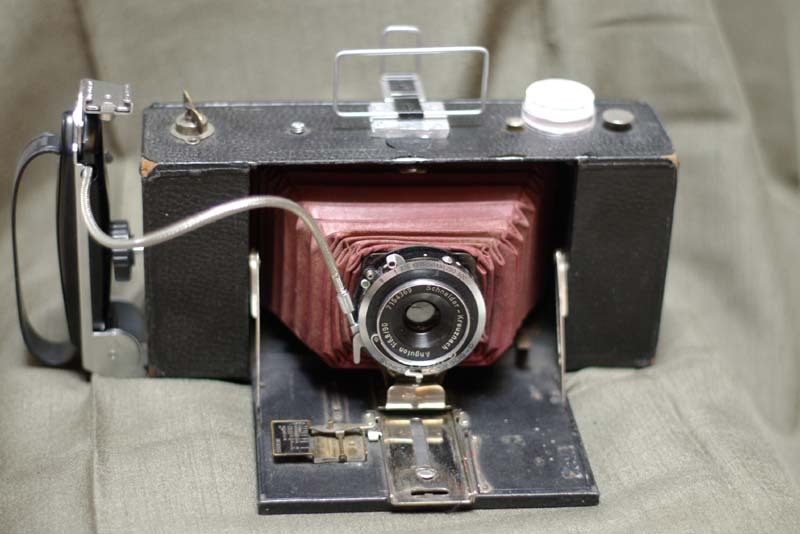 Looking from the front you can see the Schneider 90/6.8 Angulon which replaced the original lens. The mount for the Copal 0 shutter is slightly smaller than the original Kodak shutter, so it fits straight in. The white blob next to my home made wire-frame finder is a bulls-eye bubble level, bought from a hardware store for $5. The grip on the side is an old flash bracket which cost a similar amount. You can also see that the bellows are bunched together at the front. This was done deliberately as they had lost their shape and would cause vignetting otherwise. From the rear you can see the original ruby film window at top right which has been blocked off. It’s replacement, scavenged from an Agfa 6×6 folder, is at bottom left with a sticker reminding me of the correct number sequence to use when winding on. I use the 6 x 4.5 series of numbers as there are no 6×7 numbers. The sequence is 3, 6*, 9**, 12***, 16. Fuji films work best for this as they have different sized dots in between the numbers wheras as the Kodak ones are all the same size which gets confusing very quickly. Okay, here is the heart of the conversion. Two strips of brass shim have been screwed to the top and the bottom of the film gate to mask it off for the narrower film. The original 122 film gave a frame size of 3 1/4" x 5 1/2" but 120 film is 1" narrower so I’ve put the strips in to support the edges of the film. The actual frame size is 56mm x 140mm. The pressure plate is a piece of brass glued onto a piece of rubber, simple but effective. The supply spool and take up spool sit on nifty pivoting holders that were also cannibalized from the Agfa folder. The red wire holds a piece of rubber that I use as a chock to stop the supply spool from pivoting forward when in use and jamming. There is a probably a much better system but once I got this working I was happy. A close up shot of the take up spool. On the right you can just make out two pieces for square brass tube, one sliding inside the other. 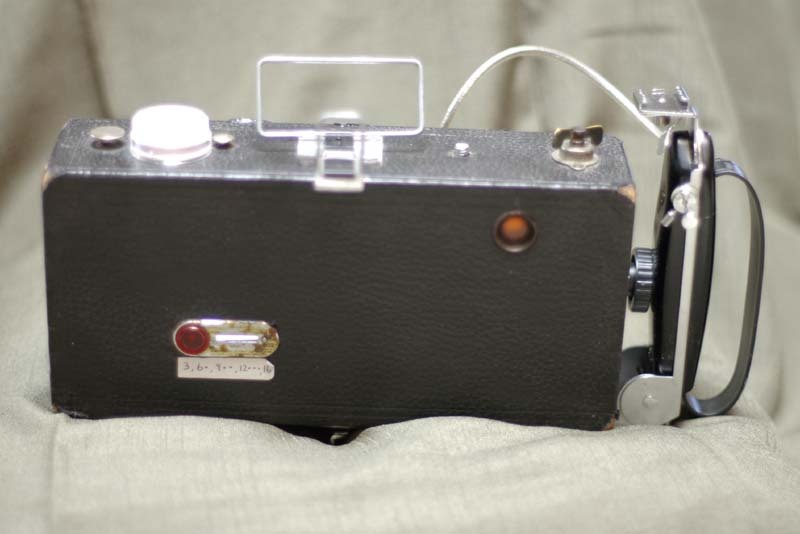 The smaller piece has been connected to the original Agfa winding mechanism, while the larger piece is connected to the Kodak winding key. When the winding key is pulled out the larger piece slides right off the smaller piece. The spool holder can then be pivoted around to take out the completed roll of film and put in an empty spool. The holder is then pivoted back and the winding key pushed back in so that the two pieces of square tube are reconnected. I like this; I’ve played around with the idea of a medium format panoramic conversion for a while and even got as far as gluing together two old 6x9s – which solved the problem of spool size – before a house move (and life) made me pack it away for several years and to date haven’t got back to it. This has re-inspired me. One question I never really solved, and isn’t addressed in your article, is how to focus it? Any comments? I made a paper scale next to the track that the front standard uses. I then calibrated it with a piece of ground glass placed over the film guides. From there it is all down to setting the approximate distance and letting DoF do the rest.